Author Achala Moulik, who was awarded the Pushkin Medal recently, recalls the profound influence the Russian iconic poet and Tagore had on her thinking. 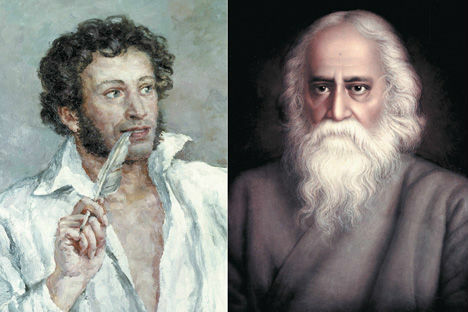 Pushkin and Tagore: Poets who fired the imagination of people. In a vast hall illumined by massive chandeliers, Russian President Dmitry Medvedev recently presented Pushkin Medals to foreigners who had contributed to the understanding of Russian culture in their countries. This silver medal with blue ribbons is embossed with the self portrait of iconic Russian poet Alexander Pushkin. Watching the glittering ceremony held in the picturesque town of Nizhni Novgorod was Prime Minister Vladimir Putin. Sitting by his side were high dignitaries of the Russian Orthodox Church, an Imam, high Russian officials, diplomats, and interpreters. The ceremony was meticulously planned and conducted, preceded and followed by stirring music, songs and folk dance. It was with a sense of fulfilment that I received the Pushkin Medal from the Russian president on November 4. As I said in my brief address, I was a humble traveller on the road that joined India and Russia, where great Russians such as Lev Tolstoy, Vassily Vershagin, Gerasim Lebedev and numerous Indologists had contributed to understanding India while the two greatest Indians of our age – Rabindranath Tagore and Mahatma Gandhi - were great admirers of Russian culture and philosophy. Achala Moulik held important posts in Karnataka and Union ministries and institutions in India. But literature and dramatics always remained her passion. Born in Kolkata in family of scholars, civil servants and diplomats, Moulik, a former Director-General of the Archaeological Survey of India, is the author of more than 20 books on culture, art and architectural monuments. Since 1976, when “Silhouettes of Russian Literature”, Moulik’s first book dedicated to the treasures of the Russian literature, was published, the author has been enthralled by this subject. Moulik's “Pushkin’s Last Poem” made a successful debut in Moscow and St. Petersburg in the Year of India in Russia in October 2009. September 2010 saw the publication of the author's seminal research work entitled, “Tolstoy’s Century in the Indian Perspective”. In 2010-11, she wrote “Rabindranath Tagore: A Man for All Times.” A chapter in the book focuses upon a comprehensive historical and literary analysis of Tagore’s “Letters from Russia.” The award ceremony was held in Nizhniy Novgorod on November 4, 2011. Moulik's profound insight into foreign cultures have imparted a distinctive character to her writing. Tagore’s Letters From Russia introduced me to that fascinating country. I read it when I was a little girl; while many of the passages on history and social reconstruction went over my head, I learnt through Gurudev’s eloquent but simple language that there was a country far away, a land of snow and forests, inhabited by courageous people. Reading the Letters many decades later, I learnt that the aristocratic landowner Rabindranath was deeply impressed by the new socio-political experiment in the Soviet Union. He was critical of some aspects of that experiment but it was with rapture that he described the Russian people. He had called Tolstoy “the teacher of mankind” and stressed that Tolstoy’s voice against violence and oppression was “crying out in the wilderness”. Mahatma Gandhi was influenced by Tolstoy’s doctrine of non-violent resistance to injustice, and called him his “Guru”. My interest in Russia deepened with the years. As a school girl in London, I began learning the Russian language in various evening classes that offered instruction. One day, I decided to go to a place called Pushkin Club where young people met to discuss Russian letters and events. Genuine students and scholars attended the classes while others posed as nihilists and revolutionaries. Fearing that I might turn to nihilism, my parents ensured that I had Russian lessons in a more conventional environment. Later, when I studied Economics at London University, I began reading Pushkin and other Russian writers. My study of and writing on Russian history, literature and music continued even after entering the Indian Administrative Service. Both Pushkin and Tagore were heralds of a literary renaissance in their countries. After elegant preludes, modern Russian literature began as a full symphony with Alexander Sergeyvich Pushkin. He was born when the French revolutionary armies swept through Europe, sowing the seeds of future revolts that would blossom into the Decembrist Revolt in Russia. Pushkin’s poems inspired the leaders of the uprising. Sometimes banished, often persecuted by the Tsarist officialdom, Pushkin never ceased to extol ideas of liberty, both for the individual and nations. But his inspiration transcended political ideologies; he drew sustenance from Russian people, both high and humble, from stirring events and challenges of the past. Tagore was born when India, like Russia, was experiencing internal ferment and external stimulus. While British rule brought many inequities, it also exposed Indians to Western science, medicine and technology. Tagore, like Pushkin, enthusiastically embraced new ideas from the West. Nevertheless, both poets drew inspiration from their own people and from their historical and cultural traditions. Pushkin composed epic poems on Russian history such as Boris Godunov, Bronze Horseman and Tagore captured heroic deeds of the past in his anthology Katha o Kahini. The two poets shared another similarity; they were both artists. Pushkin’s sketches and drawings, caricatures of himself and others can be seen in his house by the canal in St. Petersburg. Sometimes, he drew them on the margins of manuscripts. Tagore began by doodling, which formed patterns on his manuscripts from which portraits emerged. Pushkin is the most loved of all literary figures in Russia. His popularity has withstood changes in political ideology, social systems and literary styles. It has been said of Tagore that there is no episode in human existence that he has not described in his soul-stirring poems. Though both poets were ardent nationalists, they attained universality because of their intense humanism, and their gift for understanding the human predicament. Their themes on human destiny will always be relevant. Alexander Pushkin and Rabindranath Tagore are perennial inspirations for me.